Hard as it may be to believe, SEC teams did do some good things on opening night (try not to fall out of your chair). Here are several positives that might have fallen through the cracks amid the conference’s Friday night meltdown. Kentucky Bigs Own the Glass. The rebounding numbers that the Wildcats put on Grand Canyon Friday night were absurd. John Calipari’s gaggle of ultra-talented bigs grabbed 64.7 percent of the teams’ missed shots, which was good for 22 offensive rebounds. The Antelopes only had 20 total rebounds on their side, finishing the game -27 on the glass. Every Kentucky forward who played grabbed at least four boards, and while there are some open questions about the Wildcats’ outside shooting, that doesn’t really matter when they absolutely dominate on the glass. Opening night was a perfect example of this: Kentucky was just 3-of-14 from three-point land but still won the game by 40 points because Grand Canyon couldn’t take advantage of those misses. 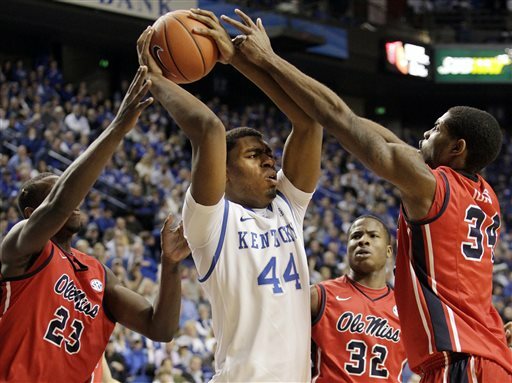 Dakari Johnson led Kentucky’s rebounding feast against Grand Canyon with 13 boards (bigstory.ap.com). The Aggies Offense. Texas A&M burned up the nets in Reed Arena on Friday night against Northwestern State, averaging a whopping 1.30 points per possession in their 109-68 win against the Demons by shooting 57 percent from the field and 47 percent from three. Seven Aggies scored in double figures, led by Antwan Space and Jalen Jones with 16 apiece. Tavario Miller was the biggest opening night surprise for Billy Kennedy, as the sophomore who averaged just 1.8 points per game last season went a perfect 6-of-6 from the field and scored 15 points. Texas A&M’s offense is a hot topic because it brings back a good defensive team from a year ago. Northwestern State wasn’t an ideal litmus test (#206 in KenPom’s rankings), but the offensive clinic the Aggies put on against them was still a very good way to start the season. Seven Sweet Scoops is the newest and hottest column by Chad Lykins, the RTC recruiting analyst. Every Friday he will discuss the seven top stories from the week in the wide world of recruiting, involving offers, which prospect visited where, recent updates regarding school lists, and more chatter from the recruiting scene. You can also check out more of his work at RTC with his weekly column “Who’s Got Next?”, as well as his work dedicated solely to Duke Basketball at Duke Hoop Blog. You can also follow Chad at his Twitter account @CLykinsBlog for up-to-date breaking news from the high school and college hoops scene. Note: ESPN Recruiting used for all player rankings. 1. 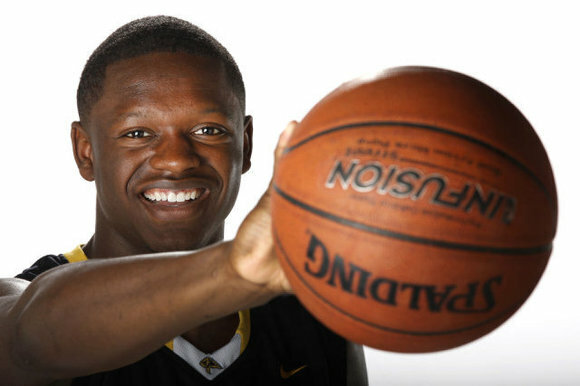 Julius Randle To Miss Three Months. Julius Randle, the No. 4 overall ranked prospect in the class of 2013, is expected to miss three months after fracturing a bone on the top of his right foot. From Prestonwood Christian Academy (Texas), Randle suffered the injury during the Thanksgiving Hoopfest on November 24. He underwent surgery on Tuesday and is targeting a return to the court either during the high school playoffs for Prestonwood, or the postseason all-star games for the senior class at the latest. Among the schools pursuing the 6’9” power forward include Florida, Kansas, Kentucky, North Carolina State, Oklahoma and Texas. Randle has already made visits to Florida, Kentucky and Oklahoma and has finalized visits to Texas (December 15-16), Kansas (December 28-30) and NC State (January 25-27), with a spring decision most likely. One day prior to his injury, Randle had notched a double-double in his first and possibly only game for Prestonwood this season with 27 points and 13 rebounds in their season-opener. 2. Andrew Wiggins Scheduling Florida State Visit. The No. 1 overall ranked prospect in the class of 2013 and widely regarded as the best high school basketball player in the nation, Andrew Wiggins is planning his first official visit to Florida State. Although the date has yet to be confirmed, it is likely that the visit will come in the first weekend of December. Since his reclassification into the senior class, Wiggins has received new interest from the likes of Kansas, North Carolina and Ohio State. However, throughout his entire recruitment two schools have been viewed as the leaders for the 6’8” small forward, Florida State and Kentucky. When speaking of the Seminoles, the Wiggins name is synonymous with their program as both of Andrew’s parents — former NBA player Mitchell Wiggins and former Canadian Olympic track star Marita Payne-Wiggins — attended Florida State. A member of Huntington Prep (West Virginia), Wiggins most recently participated alongside teammate and Florida State commit Xavier Rathan-Mayes at the Charlotte Hoops Challenge in front of Seminoles’ head coach Leonard Hamilton and associate head coach Stan Jones. With a hectic playing schedule ahead of him, Wiggins is expected to plan more visits when he can in the future with a spring decision targeted.